Definition: A “parcel mullet” refers to the phenomenon of having a well manicured short lawn in the front yard, but a wild long yard in the back. Or in laymen’s terms, business lawn in front, party lawn in the back. If you didn’t know, the mullet is a hairstyle that is short at the front and sides, and long in the back (Wikipedia). Origin of Word: This word came about during a conversation on Twitter with Heather Ostrom (@RosevilleRockLn). I had mentioned the way my front yard was neat and tidy, but my back yard was a jungle. Heather then alluded to the mullet concept (genius), which led me to think of the term “parcel mullet”. I don’t know about you, but while I keep the front yard constantly short throughout the year, I tend to let my backyard grow wild from December to March until most of the rainy season is finished. Or in other words, I grow a parcel mullet in the Winter each year (as seen in the image below). I actually enjoy mowing my lawn too, so no matter how busy I’ve been throughout the years, I have never hired a gardener. I guess I’m old school like that. Check out the Twitter feed to the right to see a portion of how this new real estate word emerged. Disclaimer: This post is in no way meant to offend anyone who has had a mullet, currently has one or will have one. It’s simply a fun way to describe a realistic yard scenario (even on my parcel). 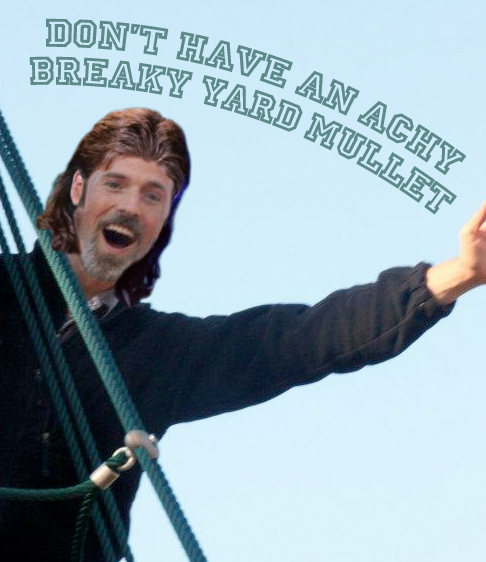 Lastly, thank you Heather for the funny mullet photoshop job. This was a great laugh after a long day!! Click the image to the right if you wish. I hope you enjoyed the post.